The Brumbies (formerly known as the ACT Brumbies, also referred to as CA Technologies Brumbies) are a SupeRugby team based in Canberra, Australia and named for the wild horses which inhabit Canberra's hinterland. The team represents the Australian Capital Territory (ACT) and southern New South Wales (NSW) regions. The Brumbies were formed in 1996 to provide a third Australian franchise for the newly-formed Super 12 (now Super 15/Super Rugby) competition. It was predicted that the Brumbies, made up of so called 'rejects' - players not wanted by the other two teams - would perform poorly. Since then, they have enjoyed more success than all the other Australian teams combined, reaching five finals and winning two. The Brumbies play in navy blue, white and gold kits. The team plays at Canberra Stadium (formerly known as Bruce Stadium) in Canberra and is currently coached by Andy Friend, who replaced Laurie Fisher after the 2008 season. The 2009 season saw a new captain, with number eight Stephen Hoiles replacing centre Stirling Mortlock in that role. The Brumbies traditional colours are navy blue, white and gold. Their primary jersey is navy with gold trim, with navy shorts and socks. The alternate jersey is primarily white with navy sides and gold trim, generally worn for away matches. The Brumbies also have a traditional jersey which is used for games against fellow Australian Super 12 foundation teams NSW and Queensland, which reflects the original home jersey worn between 1996 and 2005. This features a navy 'saddle' across the shoulders and white below chest level, with gold trim. The primary jersey sposor is software company CA with DHL the sleeve sponsor and clothing sponsorship by KooGa. The team is named after the wild horses which inhabit Canberra's hinterland. The Brumbies mascot is Brumby Jack. The Brumbies were originally known as the ACT Brumbies when they were accepted into the Super 12 for its inaugural season in 1996. Shortly after the 2004 season, two regional governing bodies in New South Wales - Far South Coast Rugby Union and Southern Inland Rugby Union, joined the ACT Rugby Union, which then renamed itself the ACT and Southern NSW Rugby Union. 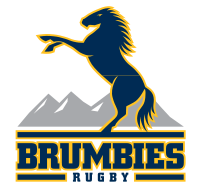 The team adopted a new name and logo for the 2005 season, dropping the "ACT" to become known simply as "The Brumbies". The name change identified that the team represented an area much larger than the Australian Capital Territory - with "Brumbies Territory" incorporating a number of regions through southern New South Wales including the Riverina, Shoalhaven, and Southern Highlands as well as the Sunraysia region incorporating parts of Victoria.